Ocala, FL (March 7, 2014) – The Florida Horse Park in Ocala saw ten-time US National Driving Champion Chester Weber write combined driving history at its Kingdom of the Sun CDE, February 19-23, as the Ocala horseman dubbed “Mr. Dressage” set a never-before-achieved score of 30.89 in the dressage phase of the Advanced Horse Team division. Then Weber and his team never looked back, holding their lead through the marathon and cones phases to emerge victorious on Sunday with a final 124.81 score. Also achieving a personal best (43.20) in his dressage score at Kingdom of the Sun was Weber’s Live Oak Driver Apprentice, Jacob Arnold, who competed IJsbrand Chardon’s talented FEI prospect, Wise Guy (aka Whooper), in the Advanced Single Horse division. Arnold, who is sponsored by Iron Spring Farm and has been competing in the Advanced divisions since 2010, was seeded fourth after the dressage phase, and was fifth overall (125.25) at the end of the three phases. 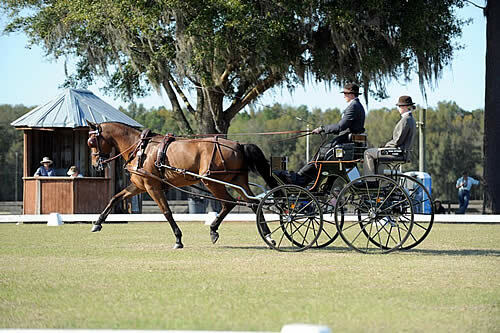 The Kingdom of the Sun CDE was an inaugural driving competition for the Florida Horse Park and a Selection Trial for drivers wishing to represent the US in the World Singles Championships in Hungary this September. It was also a good preparatory event for Team Weber, who is keeping an eye on the prize of representing the United States this summer at the 2014 World Equestrian Games in Normandy. Weber was named an Equestrian of Honor and candidate for the USEF Pegasus Awards Equestrian of the Year, after recognition by the USEF with its 2013 Becky Grand Hart Award for international success in a non-Olympic discipline. The nomination stemmed from Weber’s exceptional victories at the Little Everglades CDE and Live Oak International CDE, before going to Europe where he won the Saumur CAI-4A and Caen CAI-A4, and produced third-place finishes at CHIO Aachen and CAI Beekbergen. Weber and his horses ended the season with an historic tenth USEF Four-in-Hand National Championship at the Kentucky Classic CDE. Follow Chester and Team Weber at www.chesterweber.com and via Facebook.